A request from the other side of the pond. Jean Gulas from Flushing, New York City sent this in and would like to know when the picture was taken, if any of the people can be identified, and any background information on the Garston Docks Prize Brass Band itself. The date has to be after 1875 when the second dock at Garston was opened. By the look of the bandsmen I’d suggest a date of c1895. A website which covers brass bands very thoroughly is ‘The Internet Bandsman’s Everything Within’ - http://www.harrogate.co.uk/harrogate-band/ibew.htm - look under ‘reference’ which has info about old bands, photos etc. Nothing seems to be known about the LNW Garston Docks band, so the organisers would probably appreciate contact from your Flushing NY correspondent, and I guess would certainly want to add her photo to their website. I notice that the Garston Band photo has now appeared on the brass bands website - so maybe we’ve done some good! It may prompt some info from old bandsmen..... I’ll keep an eye on it anyway. Just that I came across on ebay a reference to Garston Docks in a magazine. I do not have the magazine nor have I read it. I just thought it may contain something. The Railway Magazine (December I think) 1908 – There is an 8 page article on Garston Docks, maybe some photos that could possibly show the little hut/house the bandsmen are pictured in front of? Or even mention them who knows? Another thought on the matter, from when the photo originally appeared –Does it have to be in the UK at all, maybe it is a Garston Docks in USA ? There's no saying this was taken at their base at Garston, but also, is it my imagination, or is there a locomotive shown, in the right background - more clearly in the unenlarged photo, with it's English style dome exactly in line with the telegraph pole? I think it could be one of those buildings which used to run down the side of Dock Rd. which ran from the Garston Hotel, St. Marys Rd to the New dock area. I'am reasonably sure because in the 1960s I used to be a Fireman at Speke Jct. and spent quite a bit of time in the area. I have a map of the area dated 1907 in front of me now. Whichever side of the road it was there was railway in the background. There were numerous buildings down there mainly but not always built of wood. At the top of the road on the right hand side as you went down was the LNWR Creosote Works which was in the days before Ditton Sleeper Depot. In the 1960s on the opposite side was built the Freightliner Terminal. As you went further down on either side behind the buildings were the coal tips where the wagons were unloaded into the ships. No matter where you looked it was all the property of the LNWR, very extensive. In my time there was still steam shunting there and you would have wagons on both front and back going up and down all day. Happy days! Hope you find the info useful. 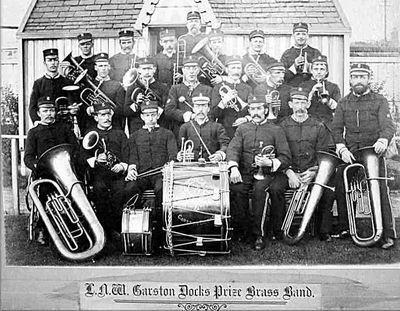 The photo of the LNWR brass band is located in Garston. I'm not too sure yet whereabouts but a big clue is in the book History of Garston. On page 29 the Garston Dock Office staff are having their photograph taken in front of the same small hut.